When Phillip McCallen decided to hang up his leathers for good after 17 years as one of most gifted and successful racers in these islands with a long string of victories to his name, it was a natural step to opening his own motorcycle dealership. That was back in 2001 and his first showroom was in Lurgan, Co Armagh, not far from his home town of Tandragee. Today he has one of the most modern show rooms and workshop in the UK. 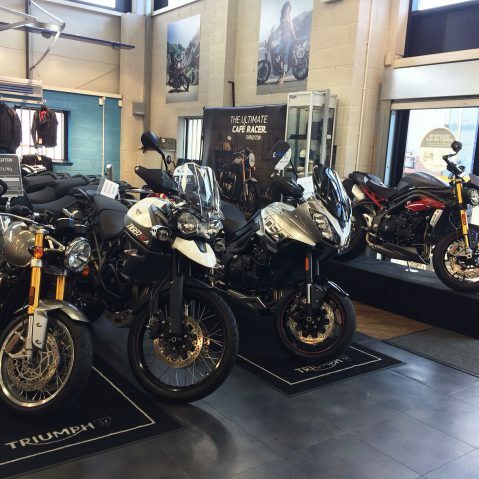 Phillip was in business for only a year when he took on the Triumph franchise and has built it up to the point where he is in the top ten of dealerships representing the Hinckley factory in Leicestershire. But getting to this stage has entailed lots of hard work, work that he was not afraid to put in when he was racing — 11 TT victories, five wins from six starts at the NW 200, five wins on one day at the Ulster Grand Prix, numerous British Supersport wins and, if that were not enough, competed in the old Formula One series, the Thunderbike series and the Macau Grand Prix. It was not long before bike enthusiasts from all over Northern Ireland the Republic of Ireland province started to visit Phillip McCallen Motorcycles at his Lurgan based business and he quickly established a reputation for making time to having a friendly word with each customer and, equally importantly, being the man to buy a new or pre-owned bike from. He and his staff really know how to package a good deal. But the business’s growth also posed a problem for Phillip – it had outgrown its first home. He looked around for new premises and in the Spring of 2009 he moved lock stock and crankshaft to purpose built 12,000 sq ft premises at the Portman Business Park on the outskirts of Lisburn, a location easily reached from both sides of the border. He cut his business teeth with the defunct Motorcycle City chain in Britain, first as a sponsored racer and then as general manager in after sales. He soon learnt that if a customer had a problem, it had to be dealt with immediately, a philosophy he has carried over to his business today. He views every customer as of equal value, from the rider who wants a new tax disc holder to the customer who wants to buy a Triumph Explorer XCA to tour the world. Please take your time to browse our very comprehensive website. 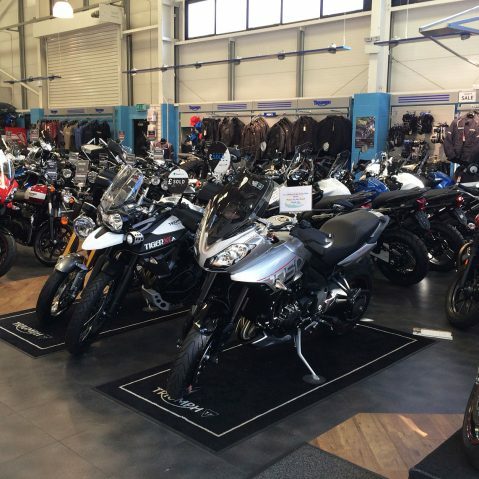 There are separate sections for Triumph new bikes, used bikes, clothing and accessories. As well as selling bikes we also hire motorcycles and this gives you an opportunity as a visitor to Northern Ireland to tour this beautiful island of ours. Of course we have a range of demo machines, too, giving you an opportunity to sample before your buy. Don’t be put off if you’re a newcomer to motorcycling; we also have our own riding training scheme to prepare you for the driving test. It’s not difficult with our expert tuition. 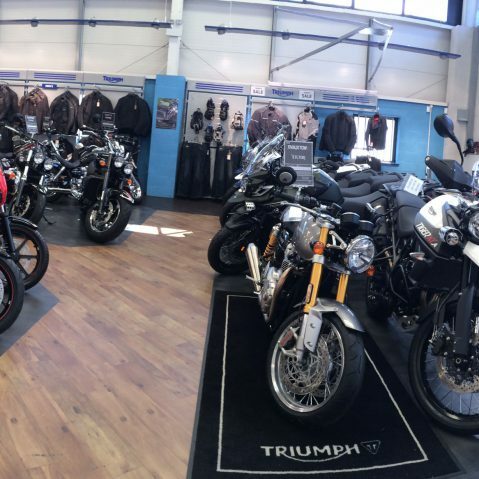 We look forward to helping you with your next motorcycle adventure, whether it is a new bike, a used bike, clothing, accessories, parts, service or training.